From rooftop sculptures and animated films to extra hours and spare minutes, PRWeek UK has meticulously picked its top March campaigns. Vote below for your favourite. Which of the 5 campaigns is your favourite? 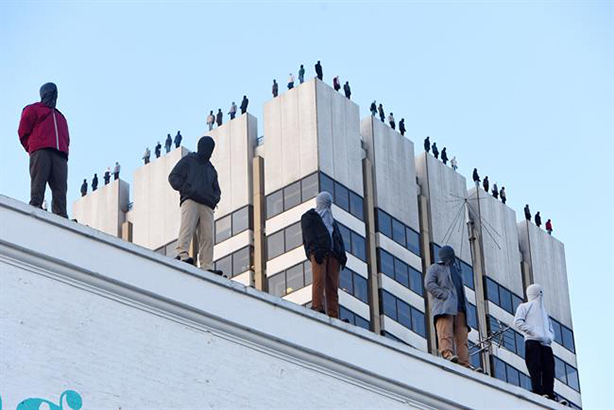 Calm, the charity that works to prevent male suicide, installed 84 sculptures of men with a hood pulled over their faces on top of the ITV Tower to raise awareness of the number of men who take their lives every week. The sculptures were created by Mark Jenkins, with support from bereaved friends and families who each lost loved ones to suicide. Created by Adam & Eve/DDB with PR run by W, the hard-hitting project was supported by ITV show This Morning across three days of programming dedicated to male suicide. It achieved widespread coverage across national and social media. The charity’s chief executive Simon Gunning said: "Project 84 is about making the scale of the situation very clear and we hope it will drive change and encourage everyone, government included, to come together to take suicide seriously." Animation studio Aardman and actor Hugh Laurie respectively created and narrated a film on Malaria's history. The campaign, convened by charity Malaria No More UK, was shown during a Commonwealth Day reception at the Houses of Parliament and called for leaders of the 53 Commonwealth states, which are disproportionately affected by the disease, to make new commitments to combat its spread. Danny Capozzi, animation director at Aardman, said: "Being a film about the history of Malaria, we wanted it to have a vintage 8mm projector feel but with a unique graphic style that would capture the audience's attention." PRWeek is a sucker for a decent pun and a well-conceived celeb endorsement. TUI-owned holiday company First Choice, and its PR agency Mischief, obviously hope the same is true of the general public. First Choice has brought in two of the cast of 2017's feelgood TV hit Love Island: Chris Hughes and Kem Cetinay, who became the undoubted stars of the show, winning over fans with their whirlwind bromance, bad rapping and well-sculpted torsos. They have been given the role of 'braggage handlers' by the company, following research revealing that Brits worry about being labelled as braggers by oversharing images of their holidays online. The two are being taken to Mexico on a First Choice break, and will document their escapades in an attempt to "encourage Brits to break their bad bragging habits by posting shots of new experiences and what they actually love, rather than conforming to the norm", the firm says. Electoral Commission – Got 5? The Electoral Commission’s nifty ‘Got 5?’ campaign targets people yet to register to vote in the May local elections, ahead of the 17 April deadline. Rather than playing on the fear factor - losing a chance to vote - the campaign is focused on the positive, emphasising the ease of registering to vote. It is running on the Commission’s social media channels, local media outlets and some outdoor advertising. The tagline refers to the times in a day when a person might have a spare five minutes — the time it would take them to register online - and uses imagery including running a bath, waiting for a bus, or waiting for nail varnish to dry to visually represent the concept of spare moments. Hotel operator Novotel had a simple but effective stunt linked to start of British Summer Time on Sunday 25 March. Guests at 30 Novotel sites were given back the hour they lost, and were able to check out at 1pm rather than the typical midday deadline. James Wheatcroft, vice president of marketing at Novotel owner AccorHotels said: "With the extra hour of late checkout, on 25 March our guests will be able to have a more relaxed and comfortable start to their day." Hope&Glory worked on the campaign and it was covered in publications including The Express and several regional newspapers.